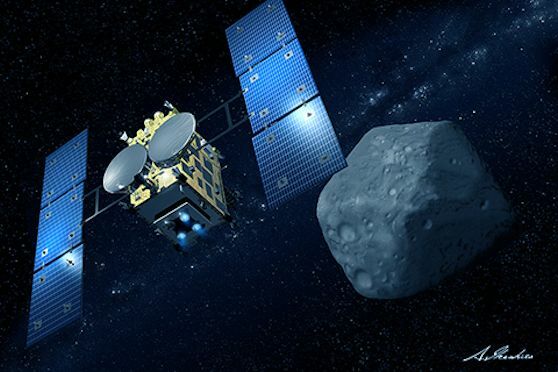 Dec. 4, 2014: On Dec. 3, the Japan Aerospace Exploration Agency (JAXA) successfully launched its Hayabusa2 mission to rendezvous with an asteroid, land a small probe plus three mini rovers on its surface, and then return samples to Earth. NASA and JAXA are cooperating on the science of the mission and NASA will receive a portion of the Hayabusa2 sample in exchange for providing Deep Space Network communications and navigation support for the mission. Hayabusa2 builds on lessons learned from JAXA’s initial Hayabusa mission, which collected samples from a small asteroid named Itokawa and returned them to Earth in June 2010. Hayabusa2’s target is an 870 meter-wide asteroid named 1999 JU3, because of the year when it was discovered by the NASA-sponsored Lincoln Near-Earth Asteroid Research project, Lexington, Massachusetts. This is a C-type asteroid which are thought to contain more organic material than other asteroids. Scientists hope to better understand how the solar system evolved by studying samples from these asteroids. The missions will also help NASA choose its target for the first-ever mission to capture and redirect an asteroid. NASA's Asteroid Redirect Mission (ARM) in the 2020s will help NASA test new technologies needed for future human missions for the Journey to Mars. Comets and asteroids contain material that formed in a disk surrounding our infant sun. The hundreds of thousands of known asteroids are leftovers from material that didn't coalesce into a planet or moon in the inner solar system. The thousands of known comets likely formed in the outer solar system, far from the sun's heat, where water exists as ice.